When I was four years old, I watched Itzhak Perlman on Sesame Street and said to my parents… “I want to play the violin!” I don’t remember saying those exact words, but my parents sure do. I was your everyday average child; I began playing soccer when I was in second grade, enjoyed math class, and made good grades. As I continued my studies and daily practicing, I began studying with Pittsburgh Symphony members, was accepted into the Pittsburgh Youth Symphony as the youngest member, attended summer music festivals, and plotted my course to be a professional violinist. I graduated high school and accepted a full scholarship for music to Penn State University. Yes, they give these to musicians! Entering my junior year, I was struggling a lot with the violin. My lessons seemed stagnant, I was receiving more criticisms than recognition, and for the first time in my life, I was not enjoying playing the violin. My repertoire was getting harder and harder, and I was being asked to memorize hours of music while keeping up good grades, and still practicing my orchestral music. I officially hit a plateau. My junior year came to an end, and I made up my mind to switch my studies to Business Logistics. I switched all my classes, told my private teacher, friends, colleagues, and, of course, my parents. I was bracing for the worst; I would lose my scholarship once I switched, all my hard work would be wasted, my friends would not understand, parents would be disappointed, and the list could go on and on. Lara Buchko at "Back to School Night"
As a last ditch effort, my private teacher urged me to attend a specific music festival for the summer to focus on my violin. I spent 16 years of my life playing the violin; I couldn’t give it up just like that! So, I attended Bay View Music Festival and spent 4 to 5 hours, 6 days a week practicing for 8 weeks. When I returned to Penn State as a senior, my colleagues, teachers, and friends could not believe the transformation that had happened with my playing. I did it! I found my stride and overcame my plateau! Playing the violin has afforded me opportunities that most people will not have in their lives: Traveling to China on an orchestral tour, performing in the French Embassies in New York City and Washington DC, debuting a new show with Walt Disney World, performing with renowned musicians, such as Sarah Brightman and Barry Manilow, and collaborating with amazing musicians and teachers from reputable orchestras and universities. Learning an instrument and overcoming challenges is a daily constant and it’s hard work! It’s hard work that not a lot of individuals try because you must learn to be focused, disciplined, resilient, able to embrace criticism and not give up at the first sign of rejection or failure. And failure happens! I share my story with you because all of us will face challenges with an instrument and in life, but how we overcome these challenges will ultimately define our pathways and us. 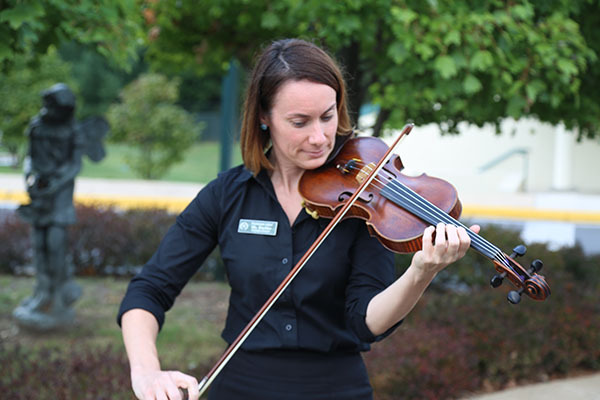 Mrs. Buchko is an excellent and enthusiastic orchestra teacher with super experience. Her positive energy has inspired my daughter to play her instrument individually and as part of the group. I would encourage all students to give the Orchestra a try.